Satellite operators are getting closer to the end-user as the result of trends that are leading to a perfect-storm. According to Northern Sky Research (NSR) satellite operators are moving closer to the end-user. Service providers are consolidating. Capacity prices are falling and end-users are demanding more connectivity. Combined, these trends form a perfect-storm for end-users to maximize the return on their communications budgets – but where does that put the satellite communications industry? NSR’s Maritime Satcom Markets, 5th Edition continues as a dedicated focus on the maritime satellite market. 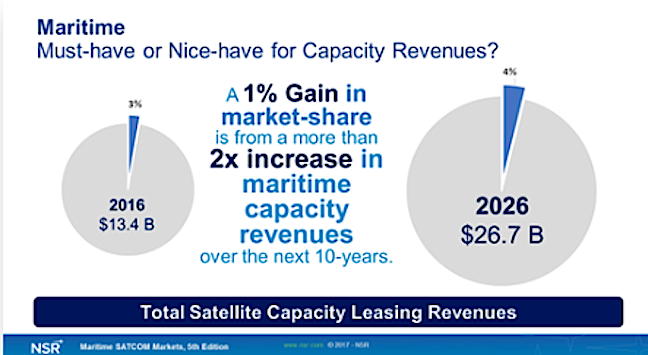 Following recent M&A activity and more services-centric partnerships by satellite operators, the report provides readers with the most complete overview onaddressable maritime markets, vendor market share, pricing, revenues, and capacity demand for all commercial maritime vertical segments. Leveraging NSR’s years of research into this vertical, NSR’s Maritime Satcom Markets, 5th Edition report compliments NSR’s studies on Aeronautical and Land-Mobile satellite mobility. This thirrd pillar of NSR’s mobility satellite coverage provides the maritime focused coverage and analysis vital for the satellite communications industry. Where will satellite operators compete the most? Are some markets or customers safe? How are falling capacity pricing impacting the uptake of bandwidth and revenue growth from end-users? How, where and what value-added services affect the way the maritime markets do business? Is there an end nearing for Service Provider Consolidation? What impacts are the recent wave of M&A’s going to have on shaping the service provider landscape in the near term?